All of the major cities have crumbled, and basic rights are a thing of the past. Now control is based on a set of moral statutes, with harsh penalties for offenders. Being simply accused means a swift arrest and trial, and no one comes back from that. They are simply forgotten. Ember gets by as best she can while trying to contain her very free spirited mother. She's learned all the ways to blend in and stay unnoticed, keeping her life relatively normal, all things considered. However all that changes the day her mother is arrested for violating Article 5 in the Moral Statues by none other than her childhood love. With her life turned upside down, she finds herself in her own personal nightmare. The only question is whether she can survive it. Ember (love that name!) is a flawed, but REAL character. Throughout Article 5 there were many times where I really wanted to strangle her for the poor decisions she was making, especially when it came to Chase. However, those mistakes only made her seem that much more real. We would all like to think that in a crisis situation we could keep our cool and know exactly what to do. Perhaps some of us could, but I have a feeling the majority of people would behave exactly like Ember. Her whole life has been turned upside down and people are trying to kill her left and right, she just isn't going to be able to accept all of that rationally, especially considering just how naive she was in the beginning. Nor would she be able to easily throw her trust into someone she felt abandoned by. She's entitled to have melt downs, and to be honest, she had a whole lot of character growth throughout Article 5, to the point where she is almost a completely different person. The world behind Article 5 is so chilling and rather horrific. I love dystopian books; there is just something about them that calls to me. However, what sets Article 5 apart is how very real it felt. It very easily could have been happening now in our world, or at least in the very near future. All it would take would be for one single conflict to go bad, and land a terrible war on U.S. soil, with religious extremists rising to take over in the aftermath. The whole concept of morality being the controlling factor of society absolutely terrifies me. Forget the Bill of Rights, keep your head down and don't dare to make a single misstep or you will pay dearly. My heart bled for these characters, in their desperation to survive, especially Ember as her eyes were painfully opened to the horrors of her world. This is one of those books where you are so far sucked into the story you don't even notice the flaws until it is time to write the review. 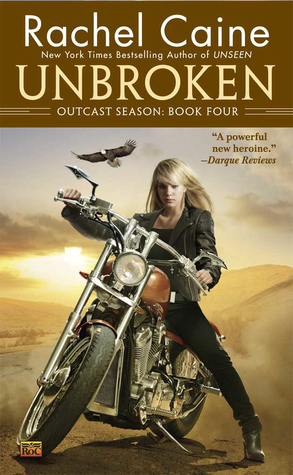 When I first finished the book I eagerly stamped a five star rating on it via goodreads, but now as I look back I realize that much of the story wasn't perfect. The idea of persecuting people for "crimes" they committed many years before there was even a law against them doesn't seem really plausible. Especially since this would impact as much as a third of the population. Also there was the issue of the too short time in the camp leaving that feeling a little undeveloped, as well as a few other things. Does that mean I'm going to now lower my rating? Absolutely not, as the reading experience was so intense, it more than warrants the five. 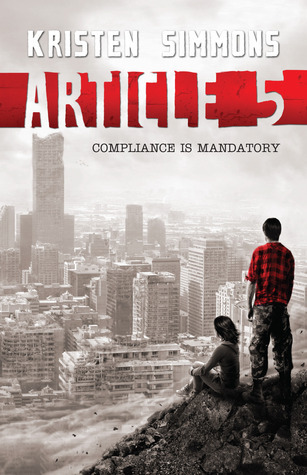 No book is ever going to be perfect, and in the end what matters most is being entertained and emotionally attached to the story, and Article 5 certainly fits that bill. So if you like a book that is so riveting and compelling, as well as impossible to put down, then Article 5 is one debut you won't want to miss! The D'Artigo sisters can never seem to catch a break. It should have been a happy time as they prepare to celebrate Iris's wedding. But things go from bad to worse when the Supe Comunity center is bombed the night before, and that is only the start. The Koyami are back and wreaking havoc yet again as they team up with another of the girls' past nemesis, a pair of nasty sorcerers. Meanwhile it looks like Shadow Wing is gearing up for another fight as he sends a new general to amp up his side of the war, and he may just be the worst one yet. In the past several installments, the war against Shadow Wing has been mostly in the background as the sisters had other issues to deal with. However, in Shaded Vision, that fight is back, front and center. The girls learn some pretty terrible things, that change their view points on the last few months, and bring to light a terrible new threat. With each new installment, I always wonder how the author is going to be able to top the previous threats so things don't start to seem like old hat. While I doubt Hyto's absolute cruelty and horribleness will ever be able to be "outdone," I will say that the new threat in Shaded Vision is pretty scary, just in a different way. Instead of being targeted at just Camile, this one is a danger to all of them, and they will definitely have their work cut out for them. In my review of Delilah's last book, Harvest Hunting, I had talked about how much Delilah had grown from the naive tabby cat we met in the beginning of the series. However, after reading Shaded Vision, I can't help being a little frustrated with her. Yes, her rose colored glasses are gone (as she calls them), but she was pretty whiny about it. I realize that she misses being able to always believe things will be okay, but now she has turned into a pessimist about pretty much everything. She also had many break downs over the changes that were going on. In fact she seemed rather selfish in her desire to have everything back to they way they used to be. She wants her sisters all to herself, and a small part of her seems to resent their significant others. I remember her being very resistant to change in the past, but not to the point of selfishness. Although I will say that she felt guilty about these feelings, so I have hopes that she will work through them and continue to grow. I didn't enjoy Shaded Vision as much as some of the other installments in this series, and a lot of that had to do with Deliliah's behavior. Now, I'm not saying it wasn't a good book, I just couldn't seem to get myself as invested as I normal do in the sister's trials. Then again, any book would have a hard time following after the incredibly, but emotionally exhausting previous installment, Courting Darkness. 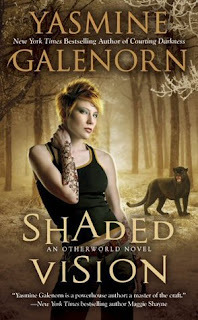 So while I am giving Shaded Vision a mediocre review, this series, still remains as one of my favorites, and I will eagerly await Menolly's next installment, Shadow Rising. When all of the males, and many of the females of her pack were poisoned, Ana knew she had to step up to protect the remaining members. But no matter how strong she is, without an Alpha male, she won't be able to hold her family's lands for long. The malicious alpha of a neighboring pack has set his sights on having both Ana, and her land for his own. Ana would do almost anything to avoid that fate, so when Connor comes back into her life, she knows she must accept him into the pack, even if it risks her heart, as he already broke it once. Connor may have left, but not without reason, and now he is back to claim what is his. But with her wariness and threats coming from all angles, his work will definitely be cut out for him. Alpha Instinct had one of my favorite elements for shifter novels, bonding/mates. It just feels natural, and quite powerful whenever something so primal and permanent is thrown into the mix. I have an easier time getting behind the "instant" love when it stems from this type of connection, as it seems deep than mere infatuation. That being said, I did have a hard time feeling the "love" between Conner and Ana. Yes, there was an incredibly strong connection between them, as well as some pretty heavy lust. Don't get me wrong I really felt that they belonged together, but at times it felt more like a biological need rather than an emotional connection. Perhaps a lot of that was due to Connor's insecurities, and his inability to open up. Whatever the reasoning, it made it a little harder for me to get truly attached to the romance part of their bonding. As far as the physical side of things, well let me just say there weren't any complaints there. Whew! Talk about hot! The mythology behind Alpha Instinct is quite interesting. While the focus was on the wolves, there was at least one other type of shifter mentioned, as well as vampires. I'm curious to see whether the future installments stick strictly to the wolves, or if things will branch out into the other races. I'd love to learn more about the rules for rest of them. Although the lupine shifters live in an "open" world they are still pretty archaic and secretive. They live for a very long time, and are very vulnerable to silver. The lupine women, despite their strength cannot expect to hold anything with out big bad male shifters to protect them. While this really isn't anything new for a shifter novel, it still was disheartening to see how easily the women accepted that fate. Then again, I really shouldn't blame them for accepting Connor's gang into their fold considering everything they have gone through. They knew they would constantly be under threat of take over from other packs, so it did seem only wise to accept help from a known source. It just disheartened me to see them backed into a corner. I have to say that what really made this book a page turner for me was the foreshadowing of the different threats. The danger came from all sides, and we got glimpses into all of the "bad guys'"heads, some obvious to their identity and others not so much. It was the ones that weren't named that had me most intrigued, and kept in suspense, as it was frustrating in such a good way to figure out the culprit. I really enjoyed the fact the while a lot of the focus was on the main couple, there also was a clear plot, as well as a set up for another couple in the next book. I very much prefer a new couple's relationship to start in a book prior to their "feature" as it allows me to get attached to them, and makes the switch in focus easier. 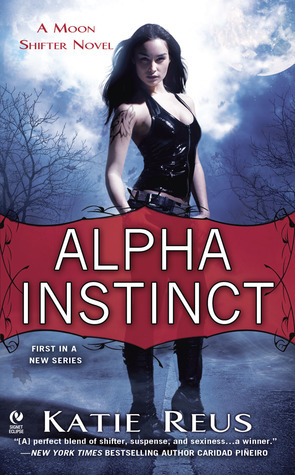 All in all, I was very impressed with this first installment with the Moon Shifters series, and I recommend Alpha Instinct to anyone who loves a good (and hot) shifter romance. Melanie is such a fun character. She's sassy and determined to not conform to man's expectations ever again. She spent many years chained to a man who expected her to always be the perfect society wife. So now that she's on her own and head of construction company, she's done with all that. But what made her really great was that while she has practically sworn off men, she isn't a bitter harpy like many women become after a nasty divorce. She just isn't interested in dating. I loved how she dressed completely inappropriately for the jobs. It was even to the point where her workers would panic if she dressed normal, they had gotten so used to the outrageous outfits. When you add that into her strong curiosity, she made for a very fun narrator. 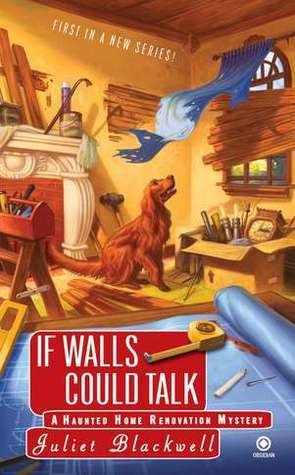 If Walls Could Talk really wouldn't fit into my genre of choice, but for a mystery it was pretty decent. I had been originally interesting in this book due to the paranormal elements in the description, but unfortunately that was only a small part of the book, making it a little hard to get into things. Perhaps I would have enjoyed it a little more if the ghost aspect had been more integral to things rather than seeming like an almost after thought. The real risks and dangers came from live people, disappointing me greatly. To be honest, I am not really sure if I will continue on with this series. I did enjoy the book, and it earned a solid three rating, but to be honest I have so many other books that will fit better into my tastes that need to be read. I'm just not sure I want to devote the time to something I will only moderately enjoy. I will however, put it on a list for the future if my tastes change. As the Archangel Raphael's second, Dmitri is very good at managing issues and assigning the proper immortal to clean up the mess. However, when a head shows up with a tattoo that reminds him of a time long past, he has a feeling this is something he must handle personally. He seeks out a guild hunter who is skilled in ancient languages. However, he never could have predicted his reaction to her, as he feels an instant deep attraction to her, something completely unheard of for him. Problem is that she is very scarred herself, having just barely survived a horrific attack, proving to be one difficult target for his affections. But Dmitri is old and very patient hunter, who always wins in the end. I'm always a little gun shy about reading books where the focus shifts in perspective from the previously established characters in the former books. I really love Elena and Raphael, and even though his arrogance does grate on my nerves at times, I think they are perfect for one another in the end. So it was with great reluctance that I started reading Archangel's Blade, especially since Dmitri definitely has not been painted in a fair light up until now. I just couldn't see how this cold creature could be possible of any type of compassion, yet alone love. I should have known better. Not only is there so much more to him that meets the eye, but a lot of his actions are a forced penance on himself. As the book went on, we got more and more glimpses into the man he was, and everything that he lost. Yes, he did harden himself to the point of almost cruelty, but most would have long crumbled under what he has suffered. Honor is every bit as damaged as Dmitri, maybe even more so. At the start of Archangel's Blade, Honor was just starting to put the pieces back together as she seemed to be nothing more than a lifeless shell. She is deeply scarred, yet still held an iron will that refused to give in to defeat. Everything that had been done to her was meant to break her, and while it all came perilously close, she still was able to hold on to some shred of sanity. Now, of course her progression towards healing was not instantaneous, and I'm sure some of the "scars" will never completely go away, but what matters in the end was her perseverance through it all, making her truly worthy of admiration. I had worried that things would move too fast between Honor and Dmitri to be realistic considering their pasts, but I was very pleased with the way things were handled. There is a twist in things that I felt really added to their relationship and made things so much more substantial. So, I have to say for any fans of the Guild Hunter series that are worried about the change in character focus, don't be, as you will fall just as hard for Honor and Dmitri as you ever did for Elena and Rapheal. 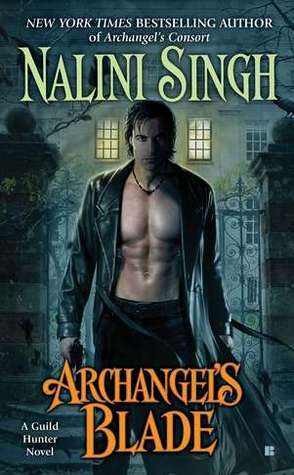 A definite two thumbs up to Nalini Singh for such talent and making me truly care for a character that I had thought was beyond redemption. Bravo! After almost dying, Elena was shocked to wake up a year later finding that she is now an Angel. Yet despite her new immortal status, the playing field has not been evened up between her and Raphael. If anything, his desire to control her is even stronger now that she is so weak. Of course she cannot stay that way for long as the most powerful known Archangel, Lijuan is throwing a ball in Elena's honor. Of course this will be no happy meet and greet as the Ancient loves to play deadly games, and now that her attention is fixated on Elena, that can only spell disaster. So you would think after the willingness to sacrifice everything for Elena would have changed Raphael's attitude towards her. But no, he is still the arrogant control freak that has a real problem with ordering her around. He is a walking contradiction in that he wants a warrior woman, yet whenever she stands up for herself, he tries to shut that down immediately. Luckily she can more than hold her own against him, and does an incredible job of "managing" him. As time went on, he bit by bit was accepting her independence, but I have a feeling it will always be a battle of wills between them to some extent. It sure keeps their relationship interesting, and whew! does that conflict ever heat things up in the bedroom. They are probably one of the most steamy couples I have ever read about as the heat practically jumps off the page. It really astonishes me that Elena is such a target from so many different sides, even potentially the ones that are fiercely loyal to Raphael himself. Raphael is supposed to be this supreme ruler whose actions and desires are never to be questioned, yet everyone keeps doing just that when it comes to Elena. I understand his Seven's point of view in that they see her as a threat to him, a weakness. 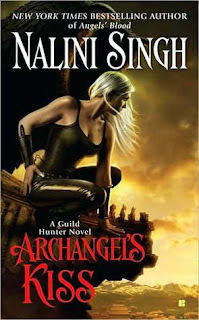 While that may be true, she also gives him a strength the other archangels can never hope to have. She will always be his lifeline against the madness that claims so many, and his people should be grateful for that. As far as everyone else, I think the animosity must stem from jealousy or greed. She is the only made angel in the known memory, so that would make her a priceless thing to covet. I guess another way to look at it is that immortal beings do not like change, and Elena definitely brings that. Even so, the constant targeting seems excessive, and I can't help but admire the strength she has to keep training so hard to protect herself. After the shocking ending of the first book, the rather anticlimactic ending of Archangel's Kiss surprised me. Everything was building up to the final showdown for the entire book, and I just don't think the result fit with the threat. Perhaps things turned out they way they did to open up things for future trouble, but I cannot help being a little disappointed in the way things were resolved. 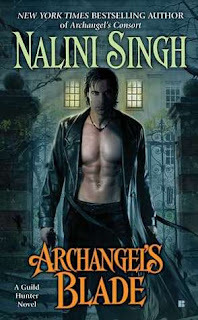 However, putting that aside, the book was still quite enjoyable, and as steamy as ever. I look forward to seeing what is in store next as Elena continues to grow into her immortality, as well as the changes in Raphael. Things should be interesting to say the least. Well, last year I read 301 books, and at times I was falling behind that goal, so I'm going to shoot for the first category of getting my heart rate up. So, at least 302. Whew! *Update 8/28: I'm a very goal oriented person, and I really hate not making the goals I've set. However that being said, my situation is currently changing and I just do not feel I can quite keep up with the rigorous pace need to read over 300 books again this year. When you break that down, that means that I have to read over 80% of a book every single day just to keep up. Between my new job, and the 1.5 hours I lose each day with driving to my daughter's school to pick her up, plus running my son to and from preschool, as well as my desire to get to the gym some century, not to mention my household responsibilities and spending time with my family, I just simply can't get that much reading in any more. So since I haven't fallen too far behind, I'm going to lower my over all goal by 27 books making it an even 275, and re-evaluate it later if necessary. *Update 11/12: Unfortunately lessening my goal by 27 book only created a short-lived breather. 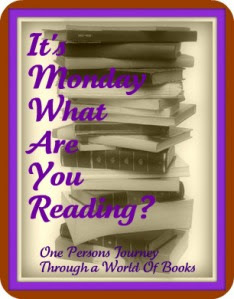 As much as I still love to read, the pressure to keep up with my goals is making it a chore. With all of my other responsibilities, I just need to lower my goal again to make things more comfortable. I simply cannot handle not meeting a goal, and as much as it pains me to lower it, I really need to. So I'm knocking it down another 15 books to bring the total to 260. That leaves me with 23 left to go for the year, which is a little over 3 books per week. Considering the holidays coming up, I'll be very happy if I am able to squeeze that many books in. Otherwise, there may just be another reducing update in store.